Eaton Main lug loadcenter is an enclosure specifically designed to house the 8 BR branch circuit breakers and wiring required to distribute power to individual circuits. It is rated at 120/240-Volt AC and 125-Amps. The 1-Phase 3-Wire loadcenter has interrupt current rating of 10-Kilo-Amps. Loadcenter contains standard tin-plated aluminum busbar and metallic enclosure. It has a dimension of 3.56-Inch x 11-Inch x 13-Inch. Flush mountable loadcenter with cover, allows user to feed 14-1/0-AWG copper/aluminum conductor through bottom or top. 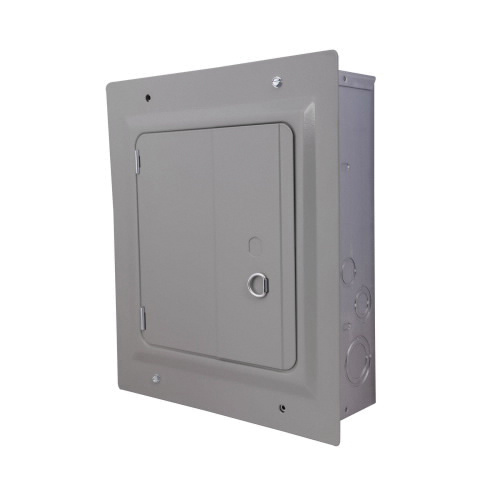 The NEMA 1 indoor rated enclosure provides insulated/bondable split neutral connection. Larger knockouts of this load center, facilitates for quick and easy installation while saving time. It has temperature rating of 60 to 75 deg C. Loadcenter is UL 50, 67 listed and NEC certified.